Laugh Now, Laugh Later marks the seventh studio album by punk rock veterans Face to Face. This album is a powerful fusion of catchy melodies and high-speed punk rock hooks. Vocalist/guitarist Trever Keith, bassist Scott Shiflett, guitarist Chad Yaro and drummer Danny Thompson deliver a straightforward punk rock album that truly showcases the underlying musical craftsmanship they’ve refined over the years. The record starts off heavy with “Should Anything Go Wrong” and steamrolls right into radio friendly “It’s All About You,” which is loaded with fast, bouncy riffs that are a throwback to Face To Face’s signature sound. “Bombs Away” is brash with chanty-sing-a-longs while “What You Came For” has a garage-punk undertone with sweet melodious vocal work by Trever Keith. 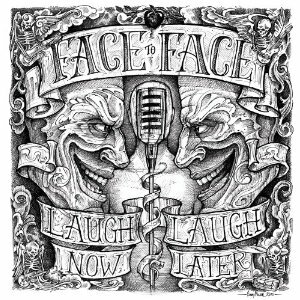 Laugh Now, Laugh Later definitely stands strong on its own and will surely appeal to fans that have followed Face To Face’s musical progression for the last two decades. Even the cover album, which was created by tattoo artist, Corey Miller (Six Feet Under Tattoo Parlor, LA Ink) is pretty amazing. This is a must add to your F2F collection.